Now that summer is here, I look forward to evenings relaxing on the porch or deck and reading, when my schedule allows. As luck would have it, our Memorial Day weekend was plan free - so I had a couple of times between the things we did to relax and read. 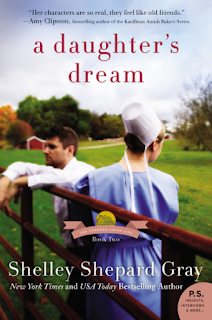 The book I read was the new book from Shelley Shepard Gray, A Daughter's Dream. A Daughter's Dream is the second in a series called The Charmed Amish Life, conveniently set in the community of Charm. I had read A Son's Vow, the first book, but A Daughter's Dream can be read as a stand alone book. The story focuses on Rebecca, a sister of Lukas from the first story, and a new to town man and niece, Jacob and Lilly. Darla and Lukas and several other characters from the first book make appearances in the story, but it is not about them. Rebecca is still trying to discover what her dreams are. She has longed to be a school teacher and fortunately, her friend Rachel has offered to allow her to help in the school and her brother offers support to allow her to spend time in the school. It is while volunteering at the school that she comes to meet Jacob and Lilly, when Jacob comes to enroll Lilly in the school. As both Rebecca and Jacob learn about themselves and the future that will make them happy and successful, they grow individually and find themselves growing together. I enjoy how Shelley Shepard Gray has the ability to write a book about the Amish with a plot that transcends the setting and the faith of the characters. She develops such a captivating set of characters and as you join them on their journey of discovering themselves, it is hard to not feel a connection with the characters. As with the first book in this series, much time is taken in developing the characters and allowing the story to unfold, and yet again, the book seems to end with a flourish of activity to tie together the loose ends. Despite this, I found the overall story an easy, enjoyable read. I look forward to the next book in this series, as I know it will likely be about some of the other shadow characters in this story and that it will allow me to follow the progress of the stories of those characters that I came to love in this story. Learn more about the book and find more reviews on the Blog Tour Landing Page.